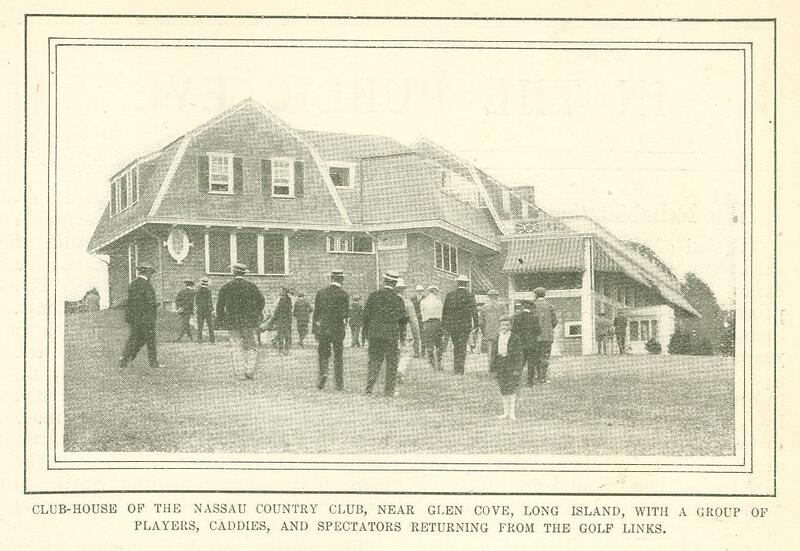 The 1902 cham­pionship, which was contested up­on the links of the Glenview Club, near Chicago, was scarcely satisfactory as a test of golfing ability. In the middle of the tourna­ment a down­pour of rain turned the pic­turesque Glen­view course into a chain of minia­ture lakes, and the last two days of play were more like some new aquatic sport than the ancient and honorable game. The visit­ing players were not familiar with the ground under these conditions, and the winner had a great advantage in playing on his home links. Travis, however, was beaten by Byers before the ele­ments interfered. During the remainder of last year James ap­peared in but few matches, and had no great success in those that he played. In the autumn he came east to enter Princeton Uni­versity. Entering for the Princeton championship, he shocked and sur­prised the whole amateur golfing world by failing to qualify for match play in the college tournament. Meanwhile Travis had been continually before the public. During last spring and the preceding autumn he met nearly all the leading golfers of the country, and invariably defeated them. In the open tournament, held at Gar­den City in October - an event to which less general interest attaches than to the amateur contest, as none but pro­fessionals are usually in the running for it - he tied for the second place. He did not happen to meet Byers, his con­queror at Glenview, until this year's tournament at Glen Cove, but his play was consistently such that he entered the lists for the 1903 championship a decided favorite among the one hun­dred and forty-five competitors in the field. Indeed. Travis' record for the past four years is practically the history of American amateur golf. He is not a native of the United States, hav­ing been born in Melbourne, Austra­lia, forty-one years ago; but his golf was learned here, as he first played the game in 1886, six years after migra­ting to this country. His progress into the front rank of golfing talent was slow, his earliest prominent appearance being in the championship tour­nament of 1898, when he met Find­lay Douglas in the semi-final round, and was rather severely defeated. In 1899 the same thing happened again, Douglas putting him out in the semi-finals, though by a narrower mar­gin than before. The following year, when the tour­nament came off on his home course at Garden City, Travis turned the tables, beating Douglas in the finals. In 1901, when he again won the championship, his hardest match was with his old an­tagonist in the semi-final round, Doug­las holding him even for thirty-seven holes, and losing at the thirty-eighth. In the other half of the round Walter E. Egan, the young Western expert, beat C. H. Seeley; in the finals, Travis won easily from Egan. And so it may fairly be said that this year's amateur tournament brought the Australian into his own again, and that he deserves the honors he won. The present holder of the coveted title is a champion in every sense of the word. He never refuses a match, no matter who the challenger. He believes that the holding of the championship makes this a duty as well as a pleasure. He plays in every important tourna­ment, and in many comparatively un­important ones. During the active golfing season - from April to Novem­ber - he spends a large part of every week upon the links. This is doubtless one of the reasons why he has perfected his game to such a point that today he stands head and shoulders above the other amateur golfers of the country, and little below the best professionals. IS GOLF IN ITS DECADENCE? While averse to talking about him­self, the champion is always willing to discuss his favorite pastime. "There are pessimists nowadays," he recently said to the writer, "who de­clare that golf is in its decadence in this country. I do not agree with them. I believe that more people are playing the game today than ever before. The sale of clubs and balls was greater this year than in 1901 or 1902, in spite of the fact that so many thousand players were already supplied with their para­phernalia. It is true no doubt that golf has ceased to be the fashionable fad. The faddists have seceded from the links, but the places of the desert­ers have been more than filled by real sportsmen, people who 1ove and enjoy the game for what it is and what it stands for. "The development of golf in the United States has certainly been marvelous. It is only about ten years since the public at large first became ac­quainted with the game. With the keen perception that is characteristic of Americans, they speedily recognized its great possibilities, and took it up with enthusiasm. It came in as a stranger; it has become an institution. Today, there are flourishing clubs in every State of the Union, and level-headed men of business are at the head of them. No sport has a finer national organization than the ruling body of golf, the U. S. G. A. State and district associations link together the golfers of various sections. Millions of dollars are represented in the chain of links and club-houses that stretches from the At­lantic to the Pacific." When asked whether he intended to do as some other champions have done, and retire from the quest for further honors now that he has won the title thrice, Mr. Travis smiled. "I am satis­fied," he said, "with winning three championship tournaments. I had set my heart on doing that. Whether I never win another I do not greatly care. I shall not retire; I love the game too much. I do not know whether I shall appear in next year's contest. That is looking too far ahead; but I shall not retire." There have been rumors that the champion is not personally so popular in the golfing world as are some other leading players. At the time of the national tournament, at least one news­paper printed reports of unpleasant­ness between the winner and the au­thorities in charge of the play. These reports Mr. Travis contradicted. "I have never been discriminated against or unfairly treated in tourna­ment play," he said. "I am glad of this opportunity to refute all such rumors. There have been occasions when deli­cate points have arisen, and at times the officials may have been over-zeal­ous. In the tournament at Nassau, in fact, I was called to account for a sup­posed breach of the rules, of which I was not guilty. I showed the referee wherein he erred, and he admitted his mistake. My opponent, who happened to be Mr. Byers - it was in the final match - did not even question the point. Such little occurrences are annoying, of course, but I am sure that both officials and players always act in the best of faith." To attempt to classify our best ama­teur golfers, with the single exception of the champion, is all exceedingly diffi­cult task, so evenly matched are ten or a dozen of the leading players. To Eben M. Byers, twice runner-up for the championship, belongs, perhaps, the second place of honor. It was Byers, as has been said, who defeated Travis at Glenview last year. This year, in the thirty-six hole final round at Nassau, he was five down with four to play. Byers is a Pittsburg man, a recent graduate of Yale, and in tournaments he represents the Allegheny Country Club. Perhaps the greatest feather in Byers' cap was his success in the recent invitation tournament on the Ekwanok links, at Manchester, Vermont. In the final round he won from Norman Hun­ter, one of the visiting English experts, who had defeated Travis earlier in the competition. Findlay S. Douglas, who learned the game at the Scottish university of St. Andrews, is a player whose share in the golf history of the last half dozen years has been second only to that of Travis. At his best, indeed, Douglas is the champion's equal, but he is a far more uneven performer, and often puts up an indifferent game. The two men have fought out some of the greatest matches ever played in America, but it is some time since the Scotsman beat the Australian Douglas wont the na­tional championship in 1898. This year his greatest success was his victory in the metropolitan tournament, which decides the championship of the New York district. 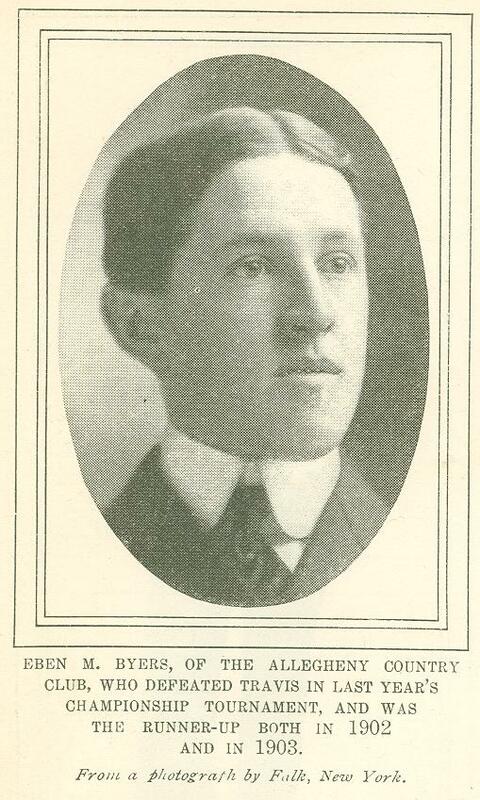 Travis had been caught "off his game" and defeated by John M. Ward, once well-known as a baseball player. As the Nassau links are Douglas' home ground, it was expected that he would make a strong bid for the 1903 championship; but he played disap­pointingly, going down in the first round, together with last year's victor, Louis N. James. Last year the American golfing world hailed the rise of a new school of ex­perts, the college players. Besides .James, of Princeton, and Byers, of Yale, such men as the Egans, of Har­vard, McFarland, of Pennsylvania, and Brokaw and Conklin, of Princeton, car­ried off most of the honors of the sea­son, winning the national and Western championships and a large share of the minor tournaments. This year the younger men have not done quite so well; but it is still true that the future of golf rests with them. They have, speaking broadly, surpassed all the vet­erans of the game except Travis and Douglas. Mention has been made of the Eng­lish golfers whose visit to the United States was a pleasant and interesting feature of the season. They were Ox­ford and Cambridge men, mostly gradu­ates, and they gave a very fine exhibi­tion of skill, meeting the strongest American teams, and losing only one match of the ten they played. As Brit­ain has many stronger golfers than these collegians, it would appear that our amateurs are scarcely equal to hers; hut the question may be more clearly settled next year, when it is hoped that an American team will cross the Atlan­tic to try its fortune on the British links. Originally published in Munsey's Magazine. November 1903.